For anyone who may be interested, Caroline from Beauty is a Sleeping Cat and Lizzy from Lizzy’s Literary Life are hosting a German Literature Month this November. The event features two readalongs, numerous giveaways, and weekly discussions. Judging by the amount of time my classes are taking up this semester, I probably won’t get everything done that’s on the agenda, but I’m planning on at the very least doing some Kafka reviews and reading something else by a German author. 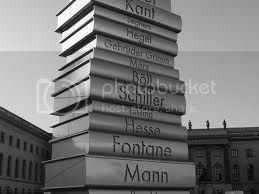 I must admit that my knowledge of German literature is somewhat lacking (although I will admit to having read Kant, Hegel, and Marx, if philosophers count). I’m open to any suggestions as far as German literature goes–I’d be willing to read anything from tales by the Brothers Grimm to Goethe. As we’re nearing the conclusion of the R.eaders I.mbibing P.eril Challenge, I’d just like to thank everyone who’s made such an awesome reading experience possible! There’s still one more week left of “The Lantern” Groupread, and a two more weeks of “Fragile Things.” I’m going to try to get at least one more book read for RIP, contingent on how much class work I have during the next week or so. Another somewhat off-topic note, to further dispel the stereotype that librarians are crotchety old ladies with no awareness of the modern world… the librarians of the Occupy Wall Street Library take the profession to the extreme, working on a volunteer basis to staff and catalog a library that has grown in the park where the demonstrations are taking place. Quite frankly, regardless of one’s political views, these librarians are badass. Thanks so much for the post and your participation. It’s very nice to have you join. I don’t think anyone is reviewing Kafka, so that’s great. I was wondering about philosophers, I was tempted to include Nietzsche or maybe Benjamin but hosting is actually quite challenging. I’ll read and review a few shorter books. Nietzsche is pretty entertaining as far as philosophers go (especially those little untranslated Latin gems, which tend to be highly inappropriate). I’m excited! Thanks for hosting it! As a grad student myself, my reviews have been pretty sparse this semester as well, so hang in there! As for German authors, have you read The Hangman’s Daughter by Oliver Potzsch? Historical thriller set in 17c Bavaria, first English translation earlier this year. I really enjoyed it. Potzsch really did his homework on the back ground and history, yet it was fast-paced and a nice read that fit well around my required reading…Have a great weekend! I haven’t heard of The Hangman’s Daughter. I’ll have to look into it! yeah! German philosophy is more up my ally. they’re probably the craziest and greatest philosphers ever. and Nietzsche is my favorite. you can almost get away with calling Thus Spoke Zarathustra a story except when it degenerates into rants. Hi Grace. Delighted to have you on board!